Sackler Family's Donation To British Museum Is Quashed Over Opioid Fallout The U.K.'s National Portrait Gallery and the Sackler family — owners of the company that makes OxyContin — say they're concerned that allegations of profiteering could overshadow the gift. 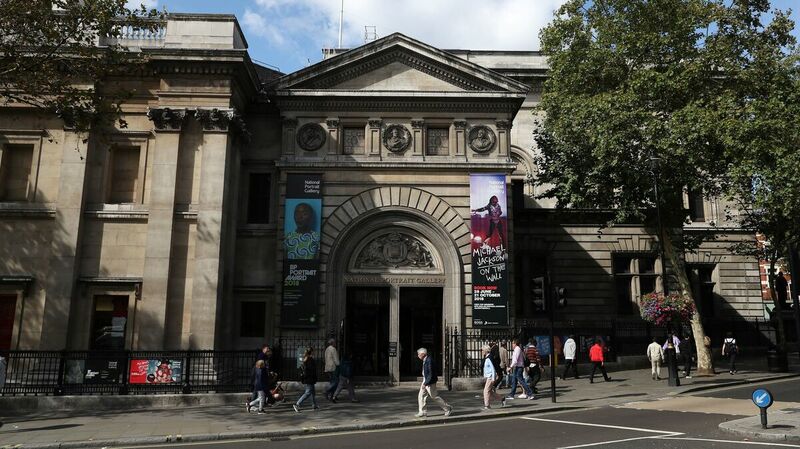 "We fully respect and support the Sackler family's decision," says a spokesperson for the National Portrait Gallery in central London, after a gift was withdrawn. Members of the Sackler family are accused of pursuing profits on OxyContin amid an opioid crisis. The Sackler family's $1.3 million donation to the U.K.'s National Portrait Gallery will not go ahead as planned, as both sides say they're concerned that allegations of opioid profiteering against the family could overshadow the gift and become a distraction. "It has become evident that recent reporting of allegations made against Sackler family members may cause this new donation to deflect the National Portrait Gallery from its important work," a spokesperson for the Sackler Trust said. "The allegations against family members are vigorously denied," the spokesperson's statement said. The Sackler family owns Purdue Pharma, the company that has made billions of dollars off of OxyContin and is accused of pressuring doctors to prescribe the opioid while also misleading the public about its dangerous addictive qualities. "The Sacklers are major donors to museums, galleries and theaters in the U.S. and Europe," NPR's Elizabeth Blair reports. "Artists and activists are putting pressure on those institutions to stop taking their money." Purdue Pharma has previously admitted to committing a felony and paid millions of dollars in fines, and it's currently facing numerous lawsuits. But one suit in particular, from Massachusetts Attorney General Maura Healey, seeks to implicate eight members of the Sackler family, accusing them of trying to maximize their profits even as they knew the painkiller was causing deadly overdoses. Since December, the Massachusetts lawsuit has added new details about the allegations, portraying former Purdue Pharma Chairman and President Richard Sackler as being "obsessed with profits in Massachusetts and the rest of the country," as member station WBUR reported in January. More revelations emerged after heavy redactions were lifted from Healey's 274-page complaint last month, showing Purdue Pharma had hired a consulting firm to help its sale reps target "high-prescribing" doctors, as WBUR reported. The lawsuit says that between 2008 and 2016, the painkiller company paid Sackler family members more than $4 billion. In response to the suit, Purdue Pharma said Healey's conclusions are wrong, and that the company is being used as a scapegoat for America's opioid crisis. Oxycodone — the semi-synthetic opiate whose forms include OxyContin and other brand names — was the No. 1 cause of overdose deaths in 2011, in cases where at least one specific drug was mentioned. Since then, heroin and fentanyl have become the top overdose threats in the ongoing opioid crisis. But through at least 2016, oxycodone's overdose rate also rose slightly, according to the Centers for Disease Control and Prevention. The Sackler family's donation to the National Portrait Gallery in London has been in limbo since 2016, when the Sackler Trust presented it as a way to help pay for a construction project. Since then, the BBC reports, "The gallery had been mulling over whether to accept it." The Sackler Trust and the National Portrait Gallery announced the gift's withdrawal in a joint statement, with museum officials repeatedly saying the decision had come from the family. "We understand and support their decision not to proceed at this time with the donation," National Portrait Gallery Chair David Ross said. A gallery spokesperson added: "We fully respect and support the Sackler family's decision." An earlier version of this story incorrectly referred to the Centers for Disease Control and Prevention as the Centers for Disease Control and Prescription.